Our mission is to focus on our customers’ needs in order to provide the highest quality construction services. Our staff is committed to excellence, and they will ensure our clients receive added value in all their dealings with Brenning Construction. Ever since our formation in 1973, Brenning Paving and Construction has been dedicated to helping the city of Ottawa stay as safe as possible. Where we walk and where we park is a huge determining factor in how we can get around the city to go about our business, so we strive to keep Ottawa’s roads, sidewalks, and pathways in top shape. Always deliver the best possible customer service. Ever since we got started, we’ve paid close attention to how we treat our clients. For 40+ years, we’ve been proud to call ourselves citizens of Ottawa, and treat everyone that we work with as a friend and a neighbour. We promise to deliver a friendly and consistent service — we deal with adversity and challenges with a smile on our faces. We look at how a job should pan out, and work to make sure that the expected outcome is provided in a timely manner. Always take the utmost of care when on your business premises. We take great care to always deliver a service that is refined, safe and thoughtful. We know that your place of business and our community means alot to you, so we work to treat it the way we would our own property. Never deliver a product that falls under the expected standards of our clients. When you hire a team with our experience, you rightfully have expectations about the service and end product that we can offer. That being said, we work as a team to deliver an exceptional customer service experience, paying attention to your needs, resulting in a job that exceeds your expectations. We always maintain a level of comfort and ease of operation when working. This means that we promise to be transparent throughout the whole process and to always keep you in the loop. Services such as ours should be courteous, careful and considerate at all times – this is what our staff works tirelessly towards each day. To deliver a finished product for the price we quoted you. The idea of hidden costs and unintended consequence should not fall on you to deal with. We offer high value for our pricing so that you can feel comfortable hiring us. Our system is all about offering consistency and credibility for a reasonable price. We do all that we can to make your project more than worth the investment. 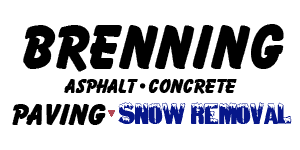 For a reliable company, experienced and capable of handling many different types of projects — Choose Brenning Paving and Construction. You can send us a message through our online contact form or feel free to give us a call at (613) 822-1316.